The house is starting to get empty. Most important stuffs have been boxed already and ready for shipment to our new address, and the rest also now in their carton will be left behind here in France. Choosing which stays and go was really a tough job for me. Asking myself do I need it or can I live without it, put me in such a dilemma. And I must tell you I really have to go a lot of my kitchen gadgets :-( sadly. But despite this vacuum invading the house we are getting more and more busy with lots of stuffs; my upcoming birthday, the christmas and new year celebrations, last minute appointments left and right. And oh the long list of christmas gifts to buy and pack, whew, tiring but really fun. In other words I'll be probably popping here and there. And oh, that thing about living my dreams, well nothing really fancy. It's just about buying and having our own beach resort and opening my Italian restaurant. I love sun and the sea, but I don't really eat fish so I needed some pasta and pizza to comfort me by. 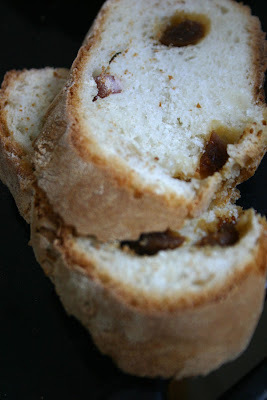 Here's an easy bread recipe I'll be sending off to Susan of Wild Yeast for her Weekly Yeastspotting! If you love bread this thing is for you. In a bowl, mix all the ingredients to make your leavening. Mix them well. Let it rise for two hours. In another bowl put your flour, salt, the leavening and the water little by little. Once the dough does not stick to your hand you dont need to add the rest of the water. 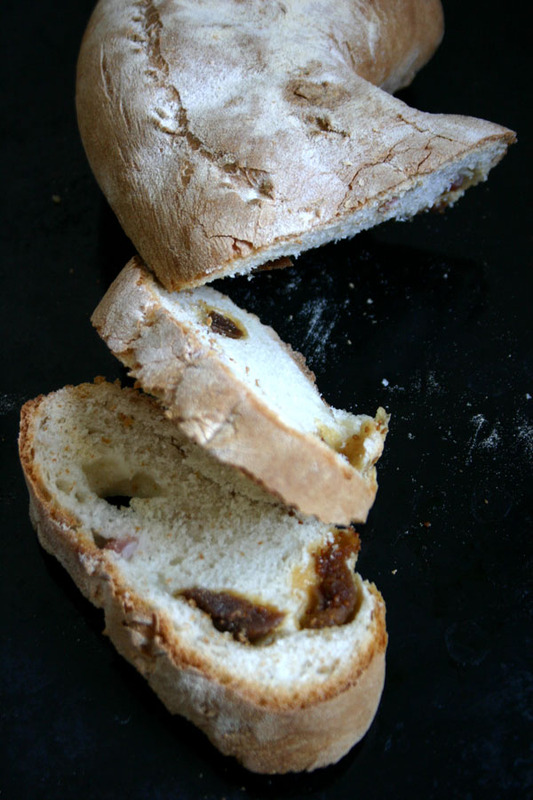 Continue kneading until it becomes, soft, elastic and does not stick to your hand. Form in a ball and let it rise for about four hours. Flatten it and make a rectangular shape. On the top cover it with your bacon and fig. Roll it from one side to the other. Let it rise for another 45 minutes. Bake it in a preheated oven at 240° for 35 minutes. If you want a crusty bread put a ramekin with some water during the baking process. wow what nice bread! marvellous! First time here, loved browsing thru your space. And I so totally relate to the experience of taking a kid's snap for an id. Mine is 4 1/2 and I just took her snap this afternoon and it took me about 17 snaps to get one acceptable picture! 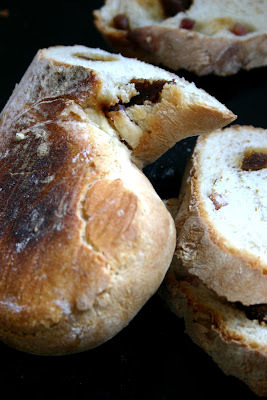 I love the sweet and salty aspect of this bread!! A marvelous bread! Very tasty! 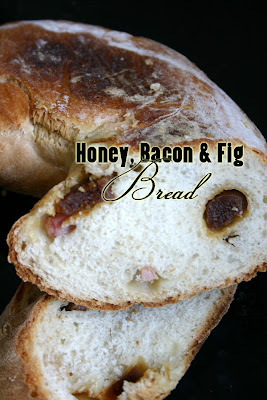 I love sweet and savory combination of flavors....what more in a bread like that. Awesome! so i was right about the restaurent thingy! the bread looks great :) and good luck with everything hilda! wow lovely combo! Bacon is always nice with something sweet! Moving is really tough. Packing is one of my least favorite things to do actually. I am a total packrat. This bread sounds delicious! I am bookmarking it to make now that I am experimenting with yeast more. Moving can be daunting ... I moved homes more than 18 times .. I know. I sooo wish I could have made this when I wasn't a vegetarian--now that I am, I guess I will have to make this with only figs...hehe. Oh! 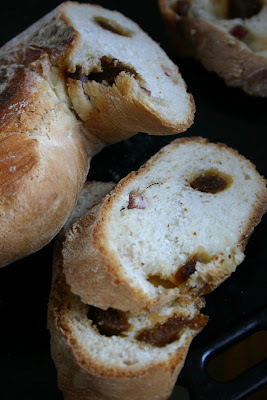 This bread must taste delicious, fig and bacon...nice pictures as well...look so yummie! NON!...you're leaving France? Where are you going? I hope the move will be smooth and quick and you can tell us all about your new life and we can continue seeing such great photos and recipes like this ig bread! Hope your move goes smoothly and the bread looks terrific! Hey, this sounds like a great idea.